Essential goods have seen the prices increasing just within one month, raising the worry that the current weak buying power would become exhausted. Exactly one month after the Electricity of Vietnam (EVN) announced the five percent power price increase, gas and petroleum distributors announced the sharp price increases for the two essential goods. Petrol price soared by 900 dong per liter, while gas price skyrocketed by 52,000 dong per tank. The public has been stunned by the thunder like news. 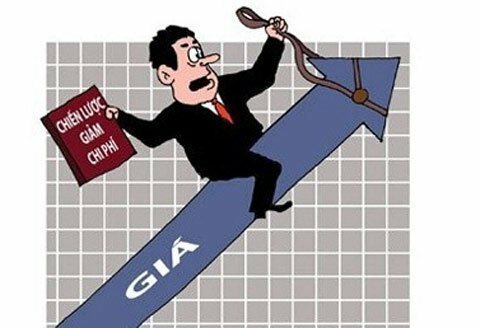 Huynh Buu Son, a well- known economist, also said that the price increases in masses would deal another blow on businesses, which are dying of big stocks and capital shortage, and on people, whose incomes cannot feed themselves. Son has warned that the price increases of the most essential goods would surely create a new price increase wave. Since petrol and oil are the input materials for production, manufacturers would have to bear higher production costs. Le Trong Nhi, an economist, also believes that the rapid fire price increases recently are like “jerking move with frequent jolts.” The instability would put more difficulties for businesses and make people lose their confidence on the government policies. Nhi has predicted that despite the price increases, the CPI would not increase, or even decrease in the time to come, because the buying power has got depleted. Therefore, he believes that what the government needs to do now is not to run for the growth indexes, but to restore people’s confidence. Nhi has reminded a report by the Ministry of Industry and Trade which said that the urgent task for now is to stimulate the demand and help businesses clear their inventories, saying that he cannot understand why the rapid fired price increases are decided at this moment. “The increases of the prices of most essential goods at this sensitive moment, when the whole country gathers strength to stimulate demand, are really unacceptable,” Nhi said. Nguyen Kieu Linh in Cau Giay district said that she got panic stricken every time when hearing about the price increases. “I am a teacher and I receive salary from the state budget. The State does not pay me higher, even though everything is getting more and more expensive,” Linh said. However, he said that if all the petroleum, electricity, gas and water prices all increase at the same time, consumers and businesses would heavily suffer. The minus CPI increases in the last two months showed the exhausting purchasing power and the stagnant production. The latest report by the Government showed that from the beginning of the year to July 20, only 40,000 new businesses registered their establishment, a decrease of 11.6 percent in comparison with the same period of the last year. In the first seven months of 2012 alone, 30,300 businesses got dissolved after they got exhausted and cannot confront difficulties any longer. “The businesses which are on the verge of bankruptcy, would be dealt a strong blow by the massive price increases,” Long said. “The price increases would make all the efforts by the ministries and branches to reduce inventories fruitless,” Son has commented.